In the movies, we often see images of ruined landscapes or apocalyptic cities. What many of us don’t know however is that much of this imagery was produced not with complicated CG software but instead, using Photoshop. 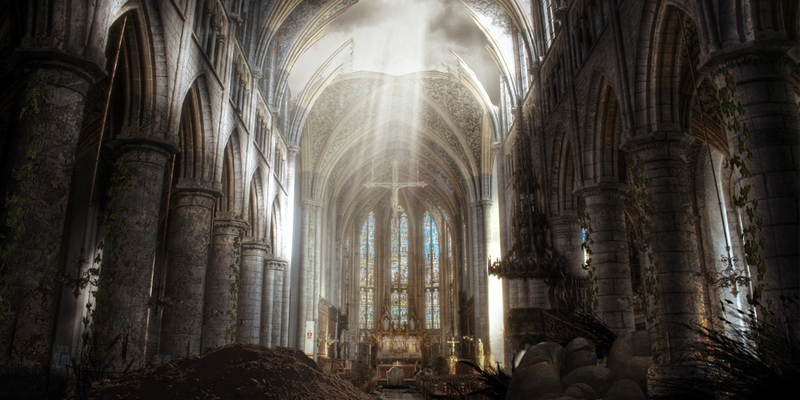 In today’s tutorial we will demonstrate how to create a post-apocalyptic matte painting of an old cathedral. Let’s get started! Create a new document. Use any size you want but for this scene I recommend using a 2:1 ratio, meaning that you can use resolutions like 2000x1000 and 1000x500. For this tutorial, I will be using the 1000x500 resolution. The color mode and bit depth do not matter for now. First, let's import the Cathedral image. You can see that it is a very large image. This is a good thing because it will downscale quite nicely. To resize and position the image, hit Command/Ctrl + T on your keyboard or go to Edit > Free transform. To scale an image while maintaining its proportions, hold the Shift key while resizing it. When you're satisfied with the result, you've now got the base of the whole composition. Go to Image > Adjustments > Levels. As you can see in the histogram, a lot of data is being stored in the black area which means that we've got an under exposured image. To get some more data out of the high and mid tones, change the value of the mid tones from 1.00 to about 1.20. Now we're ready to go. As you can see we've got a problem. At the moment this photograph was made, two people who probably wanted to ruin our image, took a seat in the wooden seats on the bottom of the image. Obviously, we want to remove the people. To do this, we are going to use one of Photoshop's amazing features, the content aware fill option. To do this, use the lasso tool or hit L on your keyboard and draw a circle around the subject. Be sure to also integrate some pieces of the environment into it so that Photoshop knows what to erase. Once selected, click with the right mouse button on the selection and under the Use: tab select Content-Aware. Unfortunately, this feature is only available in Photoshop CS5 so I would recommend people who use older versions of the software to play around with the clone stamp tool. Anyway, once the content-aware fill is applied you are probably going to have some problems. This, however, can easily be solved by using the Spot Healing Brush Tool. Ultimately you want to have a result that looks good, so some cheating is okay. Create a new layer called ''Fog'' and set the blending mode to Soft Light. Now use a big round soft brush and paint over the dark middle area of the image covering all the stuff in the back of the scene like a part of the roof and the windows. Then reduce the opacity of the layer a little bit. This will create a natural effect, because also in real life this rule generally applies: the further away you are from an object the less contrast your eyes can detect. See the comparison image below to see the effect. Now we've got to start adding elements into the scene. Let's start by modifying some big elements in the scene by adding some vines onto the main pillars of the cathedral. Load the vines image and position and scale it properly, so that the vines look like they actually grow around the pillars. Due to the fact that the vine image is pretty small compared to the first image you need to duplicate and rotate it some times. A helpful thing is to duplicate the image and then rotate it 180°. Then, when you've finished positioning the vines it's time to apply some color correction to make them blend properly. A handy tip is to look at the brightest areas of the image you want to blend your element with, in this case the cathedral image. Now, the area in the front covering the pillars is quite dark so you should decrease the high tones by taking the second point on the curve and moving it down as shown in the image after opening the Curves windows by going to Image > Adjustments > Curves. Also, you need to take a look at the color tone of the cathedral ruins, which suggests a slight increase in the red channel. Also, add a slight contrast and play around with the curves in order to make the perfect blending. Once you've repeated the process and attached the vines to multiple pillars it's time to add the other elements. Import the image of the rocks. First of all, we've got to isolate the rocks from the sky and from the sand. To do this, select the sky and the sand and then go to Refine Edge. This opens a window which is pretty much the key to advanced selections. Particularly the first option is really handy in Photoshop CS5, called the Edge Detection parameter. This will automatically detect the edges of the object you want to isolate and like magic, it makes a perfect selection. You should also play around with the other parameters like Shift Edge and Smooth. When you've got your selection, inverse it and delete the edges like shown in the animation below. Now you can place the rocks and repeat the color correction process from the third step. The same applies to the foreground dirt pile. With the basic setup done, we can now add smaller details like the tombstone in the middle. To do this, extract the stone from the image just like you extracted the stones and the vines. Then place it in the middle of the image and scale it down until it matches the perspective. Now, duplicate the image and rotate it 180° and place it directly below the original one, creating a reflection. Load a big soft brush and erase the top of the stone. Also, lower the opacity to make the reflection complete. You want to apply some color correction as well to blend the stone in. For reference you can check the image below. Right now I'm happy with the details, although you can add more if you like. The next thing that we will do, is add the foreground vegetation. You can download the brushes and then import then into your brushes palette to use them. Once you've downloaded them, you'll find that they don't contain any color, they are just shapes. This, however, doesn't really matter in this case because the light comes from behind so the things on the foreground can be very dark. Pick a dark grey color to make the composition and start playing around. In Photoshop CS5, when you hold the alt key and you hold the right mouse button you can interactively scale your brushes. Anyway, the nice thing about layers is that you can add grass on top of things, but as you can see at the rocks I've placed the grass underneath them. This provided much creative freedom. Also, I've placed some grass in front of the tombstone to make the transition from the stone to the ground a little bit smoother. This is a helpful little trick to blend things. Once, you've finished adding some final touches to the image blending you can start working on the last details. The first detail concerns the ground cracks. For these cracks, I've used an image from Videocopilot's Action Essentials 2 product. You can use other images as well as long as you've downloaded them from a stock photography site or you've made them your own. The image was originally in grayscale so I used the blending mode Overlay to delete the grey but maintain the texture. Things like cracks, holes and burn marks are always nice things to play around with so be sure to take a look at the foreground pillars to see if you can add some nice texture and damage. Now we've added all the objects into the scene and we're ready to do some other stuff. First of all, we can add a grunge texture on top of our cathedral image to spice the image up a little bit. Just look for a grunge texture and play around with the blending mode. You can just grab the eraser and erase the parts you don't want to be textured like the roof and the middle area of the images. Mostly the outer regions of the image need to be textured, like the pillars. You can see the difference on the image below. Another element you can see in the final image is the broken roof with light rays coming out of it. Let's start by duplicating the original cathedral image in case anything goes wrong when trying to delete some parts of the roof. To actually delete the parts of the roof you can play around with different selection tools but to make nice and accurate edges you just need to do it manually. This is probably the most labor-intensive part of the composition. The reason why is simple: you've got to make nice edges without any aliasing and, you must delete the right parts of the roof. For example, you can't remove one of those big mainstays while maintaining the part of the roof it supports. I prefer working with the lasso tool and then refining the selections with the Refine Edge tool as shown in the animation above. Once you're done you should have something like the image below. Obviously we can't leave the background empty so we've got to download or shoot a picture of a sky. In this case I've used a clouded sky to give the scene a more intense effect. A very important thing is to match the sky color with the interior color but a part of that will be done later with the final color correction. Simply place the sky image below the cathedral image and make some adjustments considering color, contrast etc..
Now, the cool thing is the light rays. To make the light rays, we need to extract the brightest parts of the clouds. To do this, duplicate the cloud layer and go to Image > Adjustments > Levels. Now Move the white slider to a lower value and make sure you can only see the bright parts of the image. Click the OK button and go to Filter > Blur > Radial Blur. Set the amount to 100 and the Blur Method to Zoom. Also, set the quality to best and move the center of the blur to where the light comes from: the middle top of the image. Then move the layer on top of the cathedral ruins and set the transfer mode to Screen. This is how to make the light rays. A good tip is to make some duplicates of the rays and stretch them so that you are really getting the feeling of a volumetric lightning. Also, you can adjust other things like maybe a small glow or exposure increase and some color correction. Also, you can add more details like the hanging chains to the image like I did using the techniques discussed above. A good tip by the way is to use the Liquify Tool to make the vines and chain more random looking. The image below shows what I did using the Levels and the Radial Blur. Now the composition is pretty much done. To spice the image up a little bit you can add one or more grunge texture layers and some more destructive elements like burning marks and cracks. To do this, just paste a grunge texture over the image and set the blending mode to what looks good (this varies with every image). Just erase the parts that you don't want to be textures like the roof etc.. This step considers the relighting of the scene. Obviously, all the images contain different light sources and are therefore lighted differently. The nice part of this scene is that the light source mainly comes from one place making the relighting easier. Let's start by relighting the foreground rocks. To do this, select the appropriate layer and take the Dodge Tool (or press O on your keyboard to switch between the Dodge, Burn and Sponge Tool). Now, for the Range, select the midtones and paint over the where the light comes from, so paint the top of the rocks. The dodge tool works very well together with the Burn Tool, so I recommend using the Burn Tool and make the shadows even darker by painting the dark areas of the rocks. The final thing we are going to do now is the color correction. To do this, go to Layer > New Adjustment Layer > Curves and place it on top of all the layers. First of all, add some contrast. Secondly, add some red in the midtones and remove some blue, also in the midtones. This will create a kind of ancient yellow effect. Once you're completely satisfied with your image it's time for the final crucial steps. Before doing this, however, you should save the project file as it is now under a different name because we are going to merge all the layers together now. So first save your project so that you'll keep a project file with the layers. After that, merge all the layers. Then go to Filter > Noise > Add Noise. This is a classical trick is matte painting composing because is blends everything together really well and it gives a more natural feeling because the same amount of noise is applied to everything. Another thing you can do is apply a sharpen filter to make the final integration. Only sharpen it a bit and watch out for aliasing like effects. The final image is below. Thanks for reading and I hope you learned something new!